The September box contained lots of great products and i know i will get use out of pretty much all of it this month. 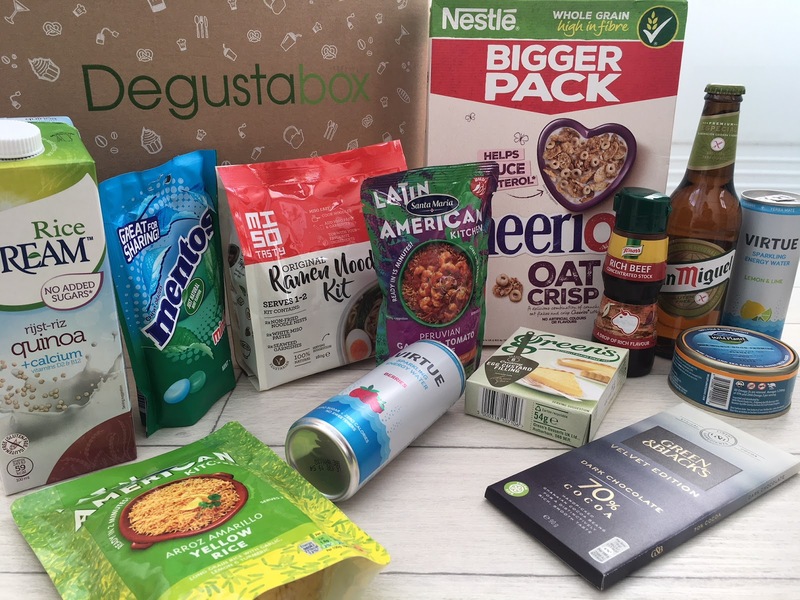 Green & Blacks, Knorr, Nestle, Dream, Green's, Wild Planet, Mentos, Virtue, Latin American, San Miguel, Seriously, MISO Tasty. 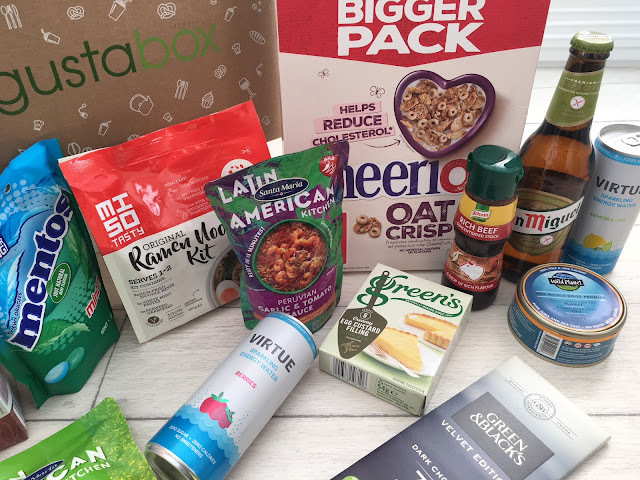 When i first opened up the box i was excited to see the Green & Blacks (for obvious reasons...chocolate), Dream Quinoa milk and the Latin American Kitchen Sauce. 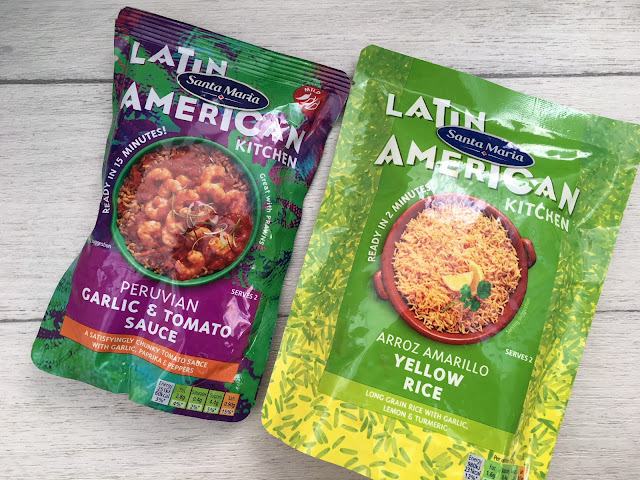 I have already used a few different flavours of the Latin American Kitchen sauce packets and they have always been a hit, the one that came in my box was Peruvian Garlic and tomato. 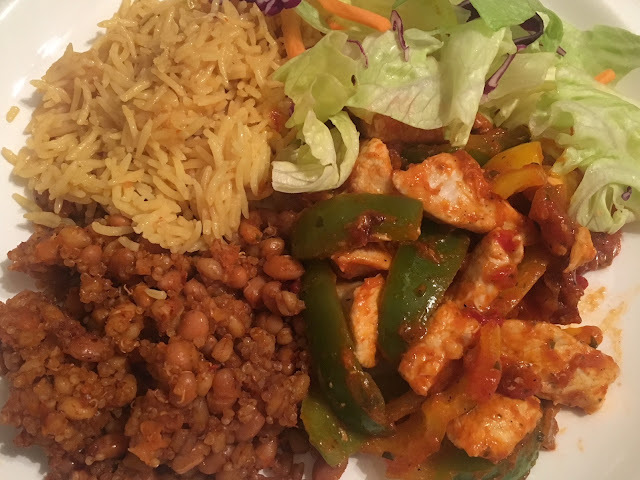 I used this the other night, i added in some chicken, peppers and served with wholegrain rice, grains and salad. Such a yummy, quick and healthy dinner. 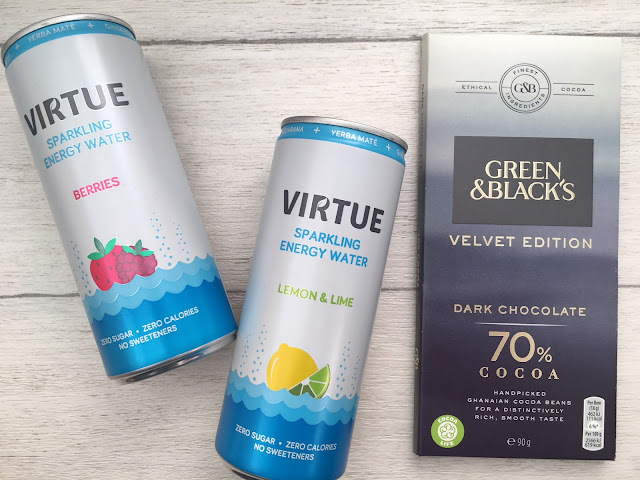 The Green & Blacks Velvet Edition 70% dark chocolate was delicious, and really does have a smooth, velvety texture. My children where happy to see a big box of the Cheerios Oat Crisp, they love cheerios already so where happy to see there was a new version to try which they really enjoy. I am yet to try the Knorr Concentrated stock, but i think this is a much easier way of adding extra richness to dishes such as spaghetti Bolognese or a nice beef stew. I have used the Knorr stock cubes before so i can imagine this is just as good. 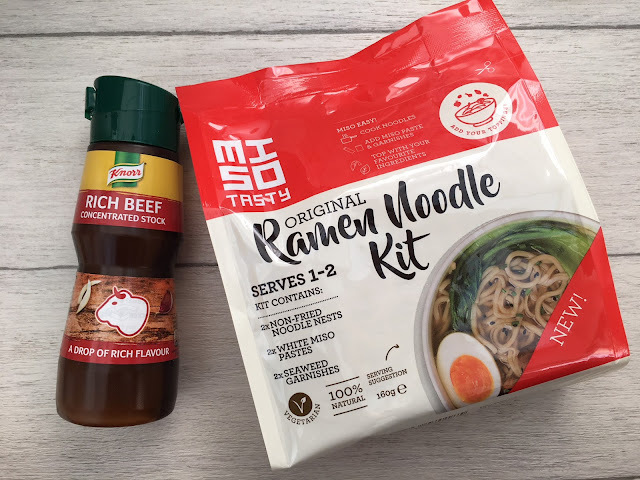 Included in this months box was also a pack of MISO Tasty Ramen Noodles. I have never tried anything like this before so i'm quite curious. It includes noodles, white miso pastes and seaweed garnishes. so you can create your own ramen noodles dish easily at home. 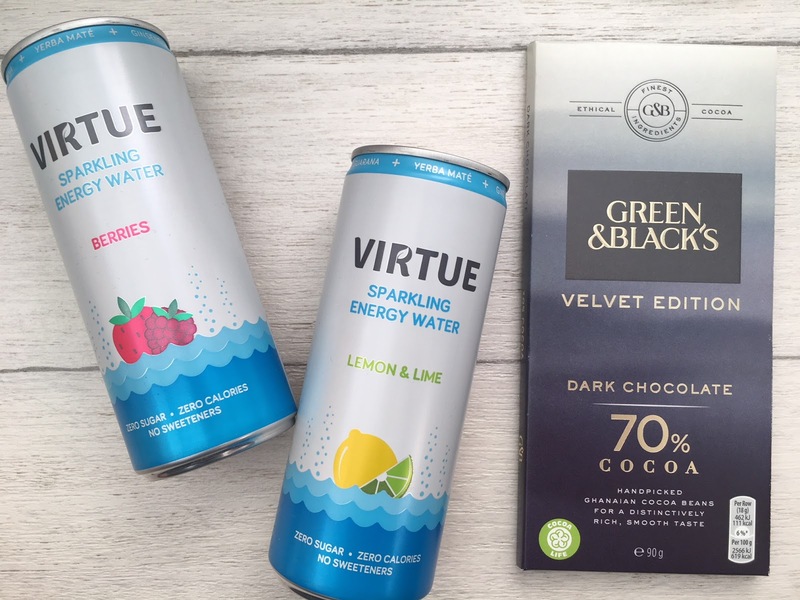 I was looking forward to trying the Virtue Sparkling energy waters in Lemon & Lime and Berries. After having a sip i realized they weren't for me. They sound lovely but im really not a fan of sparkling water, i think i was expecting them to taste more like a lemonade. Inside this Degustabox was also a huge bag of Mento mints, i have always got a pack of these in my bag, cant beat the spearmint ones. So this was a great addition to the box and it will last me ages. There is also a voucher inside to receive a box of Seriously Spreadable squares. Overall i am really happy with the contents of this months box. It is such great value at just £12.99 a month. A special discount for all my readers - Get £7 off your first box with the code (VNJG) at checkout HERE making your first box only £5.99!